Are you missing the power of Social Networking and especially Twitter by trying to use Social Media sites as though they were chat? I ask this because many on Twitter are limiting the number of users they follow – most likely to reduce the number of Tweets they receive. If you have a business, blog or Web site, limiting yourself in this way will greatly limit your success online. The simple solution is to have separate Twitter accounts for friends, family and business or use other methods for keeping in touch with them such as chat. Your business Social Networking sites can be dedicated completely to your business – and they do not need to function like one-on-one chat! Social Networking is all about NETWORKING and for that to be effective you must be willing to follow those who are important to you. If you refuse to follow them why would they follow you? [They won’t!] If they don’t follow you your networking will fail. Read on to find out who else you should be following to grow your business. “Superficial” Networking is “a waste of time”! Counting sheer numbers is “worthless” (followers, friends, subscribers, etc.). “Helping People Achieve Their Goals“…Do this “Reliably and Repeatedly” so that “over time people have an interest in helping you achieve your goals because they have a stake in it”. The exact path to getting Social Networking to achieve your goals is by HELPING OTHERS ACHIEVE THEIRS! Fans of your products or services – especially if they are vocal, blog, or are very active in Social Media. Potential Customers and Clients – go out of your way to offer assistance, answers, and suggestions. Collaborators – others with similar goals or who share the same potential buyers, clients or customers. Mentors – people who know what you would like to know more about. Influencers / Thought Leaders – focus on those IN YOUR NICHE and those who are generous and very active in Social Networking. (We’re working on a list to share.) You will get far better results from that than you will pursuing the same famous individuals everyone else is contacting. Read their bios on Social Networking sites, visit their blogs, read their about pages – find out what they do best and share that information with others. Share their best content. If you use our Comment Then Share strategy you will be benefiting them and you at the same time! Use MrTweet to recommend those you admire; writing a strong, specific recommendation is key here. Include #followfriday in your recommendation to get more visibility for them. Go out of your way to send business to potential collaborators and mentors. DO be clear on how strongly you can recommend them including explaining whether you only know them online and do NOT know their work personally. Do NOT use your accounts as one-way broadcast stations. Interacting to create relationships is key! Do NOT only post your own information and links. You can include yours but make most of what you share about others in your niche or of interest to them. Do check links BEFORE you share them so you don’t get blamed for the misdeeds of others. Do NOT fill your timeline with the same Tweet over and over; you will look like a spammer! For the same reason, do not RT or DM fads like how to get a zillion followers automatically. Be careful who you recommend and retweet because what you share reflects on you. You are NOT expected to read every Tweet! Who could possibly do that? If you want to send someone a DM (direct message) also send them an @User to let them know you did. DO keep up with your @ messages. It may not be possible to keep up with DMs. More on how to make sure you see what is most important to you on Twitter in an upcoming post. Do NOT expect to receive instant responses or to be able to always respond instantly yourself. The busier someone is the longer it may take, but do answer as soon as you can. If someone fails to reply do NOT assume they are ignoring you or annoyed at you. Assume they may not have seen your communication or are very busy. Follow up intelligently and consistently. If you send a lot of Tweets use su.pr and CoTweet to spread them out so you don’t fill up the timeline of people who follow you who have few or very inactive followers. More on that in the next post on how to be more effective on Social Networking sites. If someone Tweets your content share theirs. (If theirs is not of the quality you prefer, retweet something they have tweeted instead). You can also thank them; however, many very active users do not because that would fill their timelines with thank yous and annoy their followers. They are likely to share something else for you instead – and that is even better! When someone recommends you, thank them. If you admire them do make the time to recommend them at MrTweet and for #followfriday and elsewhere. Follow and interact with those who are active and who regularly support the efforts of others by retweeting and recommending them at MrTweet and elsewhere. Create a list of important blogs in your niche and those that contribute to your learning. Regularly visit them, leave quality comments, share what they write in Social Networking sites. WHY? Because every time you do you are building a relationship with them and relationships are what count. Be interested in and assisting them with theirs! Cross their path regularly by commenting in their blogs and sharing their content. Do this for the right people and they will do the same for you! Link to and recommend their sites from yours. Follow and recommend them at Technorati, MyBlogLog, Blog Catalog and across Social Networking sites. We can not promise results from what you do from every person you promote, but we CAN promise that many will and when someone crosses our path we DO go out of our way to assist them. Sometimes that is with recommendations, reviews, Tweets and Stumbles and sometimes it is with specific suggestions to improve what they’re doing. Often it is both. Below you will find a list of specific things you can do to improve your Social Networking relationships. We are using our own accounts as examples; however, we want it to be clear that you, too, can use these same sites to achieve your own goals and to support the efforts of others. Interested in a new career in CCNA, IBM or LPI technologies? Braindumps can provide you quick success with up to date 000-081 dumps as well as 117-101 dumps to help pass your exams the first time on time. Recommend GrowMap on MrTweet – provide a strong reason and include #followfriday. Leave comments and questions in our dofollow blog. Be sure to take advantage of KeywordLuv to select your own Anchor Text and add your Twitter ID so we and our readers can follow and retweet you. If you aren’t sure how just ask and we’ll assist. Use our comment then share strategy to drive more traffic to your site and your Twitter account too. Tweet our posts. Use su.pr to maximize traffic to your Tweets. Review our posts at StumbleUpon. Reviews can include a personal comment, an image, and excerpts from the post. Nothing drives traffic as well as we have from StumbleUpon. If you’re short on time at least give our post(s) a thumbs-up and consider adding a review later. Subscribe to GrowMap at FriendFeed. Bookmark your favorite GrowMap posts on Delicious. Be sure to use the tags you can find at the bottom of each post. You can see which GrowMap posts other Delicious users have saved. Link to GrowMap from your blog. Ask and we’ll suggest specific posts most relevant to your site. Go to the GrowMap MyBlogLog page and click Join Community (on the right under tools). Visit GrowMap Blog Catalog Blog Page and click Add to Favorites; then visit GrowMap Blog Catalog profile and click Add to Friends. If you use Google Reader or another RSS reader that allows you to share us please do. If you are active on Digg, Reddit or other Social Networks and any of our content fits your niche thank you for sharing it. If you are a regular in a forum or answering comments and notice that our answers would be useful for others we would appreciate your recommendations. Let us know where you’ve been active and we will immediately reciprocate. We spend far more time on Social Media than most anyone else you know so we can regularly expand your efforts each time you cross our path online or here. Write about us in your blog and we will write a post than incorporates your business with appropriate anchor text into it here. We will eventually do that anyway even if you do not give us a heads up. There is far more you can do in Social Networking sites and we’ll be explaining that in the future. As you can see, achieving any kind of consistency across so many different sites is not likely to happen by chance. That is why we are actively working on a complete process we can all use for tracking our Social Networking activities. Coming this week: a step-by-step process for efficiently using Social Networking. To be sure you see it Subscribe to our RSS feed (if you use a Feed Reading Program or Subscribe via email to get updates by email. David Walker: I Don’t Want to Be the As**ole At the Party! There are dozens of books on Social Networking; however, those below are some of the very best. The first is by Tamar Weinberg, pictured in the photo at the top of this post and well know and loved by many online. You may remember her unique StumbleUpon Avatar of a grinning goat wearing braces. The second is by Chris Brogan, whose Social Media blog is ranked number three today on the AdAge Power150 Daily Ranking of Marketing Blogs. There are over 65 recommendations for Chris Brogan at MrTweet – the most I’ve come across. I believe social networking is NOT chatting. And not talking to strangers. I don´t understand why many people would want to socialize with strangers through social networks. Although I respect that, I wouldn´t like to meet people this way. Social networking is how you meet people with the same interests and collaborate with them online. Gail Gardner would love you to read ..What are In Vehicle Monitoring Systems (IVMS)? I think social media is a media for social interplay, mention to online communication involve Facebook, Twitter, LinkedIn, Myspace etc, using for promoting a website. Personal IS not business..personal stuff breeds on other things! This is far the best post on Social media ive seen! I think social media is similar to blogging, in that you need to stay active with it and stick with it for months before you really develop a following. It doesn’t happen overnight but the end result can obviously be worth it! Yes, that is true but there ARE ways to do both more efficiently. See my Twitter Best Practices and Small Business Internet Marketing posts for tips. You definitely want to make sure you have all your Local Search Directory Listings – they’re like free advertising. Honestly, I don’t have any social networking accounts personally. I only made accounts for my business. It is actually helpful in promoting my products to the people. I think that’s the secret to social networking: “helping others to achieve their goals” and they will help you back. That’s great! Most of people think social networking is only a medium to chat with friends or to create new friends.But I think only those people know its value who are using it to promote their business and getting some positive results.So this is time to know exact meaning of social networking. I think people ll know value of social networking very soon. Besides keeping in touch with friends, social networking is also the new platform for promoting one’s business. It is also better to keep separate accounts for friends and business because it makes things more organized. Social networking has really taken shape into a new boon, instead of using the traditional way of advertisement the new modern approach of reaching out to millions at an instant through advertising and marketing on social media is the magical mantra of advance modern age. Do keep in mind that social networking takes a lot of time, time that may be hard to come by if you’re a busy business person. Thanks this post really opened my eyes. it is not only eye opening rather very beneficial for the people those who want to do something good in his life . You hit on a good point, most social networking really is meaning “me too” nonsense more than actually being useful! Now a days,social networking has become a very powerful way to promote our business.There are so many websites like twitter,facebook,myspace etc which can help us to find targeted audience under our industry. Anyway,you explained very well about use of social networking sites to our market in this article.I hope this article ll do help lot of people. I totally agreed that social networking is not only use for chat but it is also a big help in order to increase ranks or even building new sites. I agree with you completely. I wish all the folks who use Twitter like it’s AIM Instant Messanger would read this post. Twitter is exploding and I think it is going to set some new standards soon. I agree that twitter is not chat, but I have had difficulty in finding examples of professional services using twitter. A little inspiration would be nice. It is surely a means of communication but for your business and personal interest, its really better if you have separate account for your business and personal use. You can inform your friends and family about your business but you cannot tell all your clients about your personals like your family. BTW, the Grow Map is actually great! I’m using it since then and still don’t have complains on it. I agree, social networking is used to get a message through to for marketing, not to chit chat! I thnk that social media is best for brand building. It’s hard to get targeted leads of out of FB or Twitter. I believe there are enough social networking sites that everyone should always have something to. Everyone is on twitter and facebook, so why not share with them your time. Treating a social networking platform like a chat room, will leave you with confusing results. .-= bJones@BarkOff´s featured blog ..BioEnergiser =-. i am agreed with you that social networking is not a chat, but let me clear in social network you share your thoughts and thinking’s about different things, is it not chatting…..????? please do ans me if u can…. What I meant about Social Networking sites not being like chat is that chat is more for one-on-one conversation. Limiting Twitter and other Social Media accounts to the number of people you can comfortably chat with greatly reduces their benefits. It IS chatting but it is mass chatting while allowing others to eavesdrop on what you’re saying rather than individual private chatting. Thanks for this useful information. I already started maximizing the use of twitter to help my blog. I am now on the process of also using Facebook as a tool to increase traffic in my site. Social Networking is truly not just for leisure but for business too. .-= Claire@Great Destinations´s last blog ..Continental Airlines Cheap Promo Fares =-. 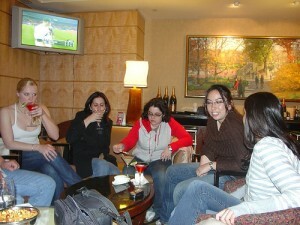 For lot of college students, social networking is just a time pass via chatting,getting new friends etc. But there are lot of business benefits of social networking. .-= Daniel´s last blog ..Longboat Key, Florida: Beach, Ocean, & Sky =-. It is nice to find Tamar there. I am her great fan. Social networking relationships are supposed to benefit both parties. .-= Susan´s last blog ..Rockin Roll Patterns on the Piano – Sample Lesson =-. Also can u tell me top 3 social networking sites other than twitter and facebook? .-= Andy´s last blog ..Bark Off Reviews =-. I fully agree that social Networking is all about networking and for that to be effective you must be willing to follow those who are important to you. But these days these sites are losing their importance as they used to be. You explained the topic very well.All the things are dependent on the content of the website. You don’t have to follow everyone but if you don’t want to listen to someone why should they listen to you? We can use Twitter lists to focus on Tweets from specific sub-groups of our followers while following them. I suspect by their actions that Twitter’s focus is on how many users and followers there are because they have pressured companies that offer solutions allowing us to unfollow inactive users to remove that function. I don’t know why but I have the impression that social networks are loosing their power, their meaning, 2 day it is harder to find a simple user lot of accounts are trying to promote smth. I blame 4 this SEO specialists who destroyed them. .-= Cynthia´s last blog ..Happy CARD Day! =-. They are not losing power so much as finding their place. There are too many and each user must figure out which specific networks best meet their needs. While it is fashionable to blame SEOs for many issues the basic reason for SEO is to make it easier for us to find exactly what we want to find when searching. That is a good thing. Some SEOs do that in unethical ways and that is unfortunate but SEOs in general and search engine optimization itself is not a bad thing. The search engines and especially the big G doesn’t like it because they favor the big brands and using SEO small businesses can be found and succeed. .-= growmap´s last blog ..Twelve Generous FollowFriday Folks =-. I am just getting into social networking and realizing its benefits of being able to access such a large audience. Understanding the correct way of using social media as a marketing tool. .-= James@Earn Free´s last blog ..Social Media Marketing =-. We are all just learning and we need to understand that no one just getting into Social Networking is going to know what works and what doesn’t yet. That takes testing over time. .-= growmap´s last blog ..MEME: BizLuv in Support of Small Businesses =-. I think social networking has been a very short time frame revolution and has provided a great way of marketing and networking without the cost. Twitter has allowed small businesses to really build a presence and brand online. .-= Van@Forex´s last blog ..What makes a Trader =-. I heard of so many marketers that have developed 3-5 million followers on Twitter. How can they do this? This must be only a one way broadcast and no time to interact with all of their folowers. I see the need to treat Twitter as a true social networking site and really leverage your relationships. .-= Brian@Manual Juicer´s last blog ..Where I can buy the best orange juicer =-. Only someone who is famous is likely to have millions of followers at Twitter. You can have thousands if you use Twitter lists to filter who you interact with there. social networking sites becoming more and more popular among every one really great way to advertise you products and helpful in making healthy business relationships. Social networking has been around us for quite a long time and now there is a change in the trends. Global recession is what people point out as a reason that is degrading the popularity of the social networks. The real fact is that social networking is headed towards a different path. Yes i think social networking site really help to get traffic and for link building as well and at the other side social media is wonderful to promote business.thanks! I just joined you on StumbleUpon & FriendFeed, and am already following you on Twitter. 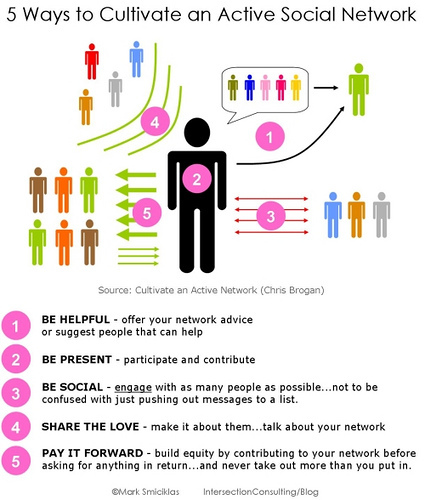 Great, great post onhow to effectively social network! .-= Kikolani´s last blog ..Best of Social Media on Kikolani in 2009 =-. I know this post is a little too much for beginners but for bloggers like you it may have some new tips and it can help us connect with each other wherever we are active. I feel like the carnival guy with all the plates spinning on top of poles most of the time. I can not get to everything all the time but I do get around sequentially. I’ve got to make time to comment and share your posts more consistently. Surely social networking is not a chat but its a way to communicate in the society and share the knowledge among them selves. Its a fact that communication is the one of the best way to gain knowledge. You’ll be able to additionally develop relationships and introduce folks to what you have got to offer. If you have got never looked into social networking then it is time that you just did.really very useful for your business. Another wonderful articles. Thanks for the inspiration! I think Social media should include everything that has to do with personally interacting with a community sharing information amongst each other. Well i am working on the internet for last many years and now i know how use ful it is. So i think most of the people think that this is only a chatting medium through which they can talk to their friends. But they are totally wrong because they do not know about the power of the internet and the social media. .-= ANSH@acdsee coupon code´s last blog ..Special offer =-. there is so much junk on internet that it is not easy to find good quality contents when you really need them.i found your blog very informative learned lot here about social networking.thanks to you for sharing your knowledge. Very true and sound advice. More people = more $. Social networking is defined as the grouping of individuals together into to specific groups, often like a small community.its is very useful in making good business relation.well i got many key points here definite i will use them. Social networking is the grouping of individuals into specific groups, like small rural communities this means that anyone can become a member, no matter what their hobbies, beliefs, or views are.its very helpful in developing good business relation. .-= monika@Smooth Fitness coupons´s last blog ..AFSHIP09 =-. Social networking have lots of applications so you are free to do any thing on the web but what i feel that people have a miss consumption about social networking that it’s a chatting program. so don’t underestimate the power of social networking. .-= ANSH@Smooth Fitness coupons´s last blog ..daj654 =-. THANKS FOR THIS WONDERFUL INFORMATION I AGREE WITH YOU SOCIAL NETWORKING SITES ARE NOT FOR CHAT THEY HELPS YOU IN MAKING HEALTHY BUSINESS RELATIONSHIPS.THATS IT.KEEP POSTING. I have received some excellent job leads by using social networking. It seems everyone knows at least one person who could use my services. .-= Rocky@twisted x boots´s last blog ..Kenny Chesney: Possibly the Hottest Male Crossover Artist in Country Music Today =-. .-= shawncattralin´s last blog ..Be Healthy Always "Healthy Zone" =-. While you CAN chat there my point is that if you limit your following activities so you can use it as chat you greatly limit what Social Networking can do for you. If there are specific individuals you want to chat back and forth with instead of reducing your Social Media interactions simply use a regular chat service like Yahoo! Messenger, MSN Messenger, AOL Messenger, etc. They are all much better for having real-time discussions and making sure you don’t miss messages from specific people. Social Networking websites like facebook, orkut & twitter are popular & growing day by day. It really helps a businessman to promote their business if you know how to use it. Beside this i disagree with the above post, some social networking sites can be used for chatting. I mean new applications are introduced for chatting. social networking websites are very popular nowadays.They are one of the important factor in linkbuilding because we get many backlinks which helps in healthy business environment. social media helps to build a network and also to get backlinks and for link building as well. .-= saurabh@mp3 songs´s last blog ..Kurbaan Songs =-. While Tweets are theoretically nofollow some do get indexed in the search engines so yes they are beneficial for SEO. Analytics are far more limited in what they can track than most people realize. Just yesterday I saw an excellent post at Social Media Today about Google Analytics not tracking traffic from Twitter. Just because you can not accurately track where your traffic and sales are coming from does NOT mean you should discount the results. Those who are wise should implement Olivier Blanchard’s use of Timelines to Track Social Networking Effectiveness to reveal whether their efforts are working or not. absolutely, social networking is totally based on business and following one another, while chat is just gossips, chat could be an networking one, but networking cannot be considered as a chat. While that can be true we can waste time gossiping on both Social Networks or in chat windows OR we can use these tools to increase our knowledge, share what we know, or do research. It is not the tools – it is what we choose to do with them – that counts. My title actually refers more to limiting who you follow because you can’t keep up with messages from the few. If you want to converse one-on-one it makes more sense to use a chat function like Yahoo! Messenger, AOL Messenger or MSN Messenger for that. Twitter is for interacting with many – not chatting with one. As always, you delivered yet again. Now it’s up to me and the others in here to put these tips into action. And I’ll be waiting for that list of “thought leaders”. Thanks again for a wonderful read. Thank you Terry – both for reading and for taking the time to comment. The post I am currently working on will greatly assist you in putting these tips into action more effectively. It is a huge amount of work although few will realize or appreciate how much research, testing and tweaking goes into the processes I detail in my posts. Let me know what type of “thought leaders” you would most want to know about and I’ll recommend the best. That is my shortcut to learning any subject: identify who knows the most about what I want to learn and go directly to them. Most people who dedicate their lives to learning are more than willing to share what they know with someone sincerely interested who can ask intelligent questions. Researching to know what to ask is the first, important step. You must know what you don’t know in order to really learn a subject! You may be interested in people we’ve mentioned in Intelligent Bloggers to Consider Reading and Top Ten FriendFeed Challenge and Top Ten Niche Twitter Lists . Besides Louis Gray, Mike Fruchter, Adam Singer, Guy Kawasaki, Robert Scoble, Tim O’Reilly and many others who would be on those pages you might also check out futurists and long thinkers such as Kevin Kelly and early implementers such as Tim Ferriss. This is one of the best guides to effectively using Twitter I’ve ever read! I especially liked your 10 unwritten rules. You mentioned that limiting the number of people you follow back limits the effectiveness of your Twitter efforts. Do you think that means you should follow absolutely everyone back who follows you? Or do you make exceptions? .-= Spot@travel blog´s last blog ..The Best Pedicure in Paris =-. I know I have answered this comment twice and twice my answer did not show up. My apologies for the delay. I do not follow obvious spammers or anyone who posts objectionable content and I do wish some I have not unfollowed (yet) would clean up their language. While some words are more common now that does not mean they are appropriate in business or mixed company. I like how Chris Brogan answered when I asked him a similar question. To paraphrase he said he followed everyone who didn’t annoy him. I don’t see why people think we should be willing to follow them if they don’t want to interact with us. I make a few exceptions for major thinkers who are brilliant but aren’t very sociable; however, I usually only follow those willing to follow me back. Remember that you want to spend your time interacting with those whose interests intersect with yours. Huge numbers of followers for the sake of numbers mean little; followers interested in what you’re interested in – THAT is where the value is. Have you read Tamar’s new book The New Community Rules: Marketing on the Social Web yet? Great overview of how to use Social Networking for Business. A very interesting and informative post Growmap! congratulations! you have brought together some very essentials of dos and don’t s for any kind of social networking site be it twitter or facebook, anyone using one account for all the purpose is strict no no because you will fell divided between work n friends and family , I also like your ideas and the marketing strategies that you use for Growmap, its absolutely fantastic to follow your favorite blog on Twitter. .-= Ching Ya´s last blog ..11 Great Posts From Readers’ Blogs =-. Thank you Ching Ya. I appreciate your Tweet and it did help many others find this post and even better I now know about your blog and can’t wait to read some of the 11 great posts you’ve gathered up on Social Networking this week. Most welcome. Glad a little tweet sent some traffic your way. For any of your readers that question these activities as THEORETICAL…they can contact me direct. We’re a small business and we MUST have leads. The process that you’ve outlined is a lead generating sequence. Again, have them contact me direct bill (a) goodmillwork.com and I’ll gladly share RESULTS. Again, thank you for your continued diligence to document and make available your research in a concise and step-by-step overview. Thank you Bill. That is very generous of you. Perhaps I do not stress often enough that the only thing that truly matters when it comes to methods for growing a business is the RESULTS you get – and results must always contribute to profitability. I am still working on the step-by-step method that anyone will be able to follow and hope to publish it by early next week. As usual, it is far more complex to document than I had originally expected. Nice and impressive news I like your social networking resources. Thanks! I will bookmark this page. You are doing just great keep it up. .-= Bollywood News´s last blog ..Teen Patti won’t release with Paa =-. I hope that you and others will read my post on How to Leave Comments That Don’t Get Deleted — Are You Seen As a Contributor or a Spammer. I suspect that many don’t really know that many of their comments are getting deleted or even having them marked as SPAM which can make it very difficult to leave comments in the future. There are so many points you could make or questions you could ask in a long post like this one that it really is not that hard to greatly improve your comments. Taking the time to leave quality comments is a great way to attract visitors to your site. For those who need additional motivation read How Our Commenting Strategy Increased Our Traffic 54.87%. I would be happy to personally work with anyone who could use some one-on-one evaluation of their comments. Even though there isn’t anything really “wrong” with this comment I guarantee it would get deleted in most blogs. Instead of doing that here I would rather assist you and others in learning how to write better comments. Yes you can use Twitter and some of the other Networking services for chat many actually recommend taking your conversation “offline” if it is continual so you don’t annoy your followers. My main point, though, is that limiting your Twitter account to a few friends is not the best way to leverage such a powerful resource. GrowMap is the GPS of social networking and the HOW TO of Web 2.0. I read pages and pages and pages of stuff, but I have yet to find anyone that consolidates ALL into a step-by-step guide. Recently having commented that the publisher behind the ‘DUMMY’ books would be crazy not to approach GrowMap…I’m officially now calling em out (www.dummies.com…get on the ball). Small biz owners we need to be passing the hat for resources like GrowMap. Here’s what I LOVE…I can review, print and hand-off simply asking that my team follow the instruction set. If you question the benefit of what’s offered on this and other posts…calc your time at a buck fifty an hour ($150 for those on the slow train) and then spend your weekend coming up with what your team needs to know regarding effectively operating in a social networking environment on the clock. Absolute NO BRAINER. Don’t think, just print and follow the instruction set. You’ll have time to ponder once your team is fully engaged and new relationships, opportunities and business starts falling from the sky. Once again, my hat is off. BRAVO! .-= William Sutton´s last blog ..Good Millwork: Reclaimed Wood in Seaside, FL =-. Thank you, Bill. I can always count on you to comprehend and take action. What many will not realize – and especially the reviewer who panned this post at StumbleUpon – is that we don’t operate in a vaccuum. These are not THEORIES – they are proven strategies we are actively using to grow specific individual businesses. I do recognize that the list of ways to assist others is long; however, whatever part of it someone is willing to use will definitely assist them too. I would love to have that reviewer claim that this will not work in the face of actually measuring the results! Not to sound like a wet blanket here, but I don’t really use Twitter or Facebook as much as everyone here. I have accounts but don’t really use them as much as I should. However, I’m very active in my local Yelp Talk and have made a lot of business c0ntacts through that site! Therefore, I’m a fan of Social Networking online— but you don’t need FB or Twitter to accomplish that objective! You are already on the right track and don’t need to network nearly as much since your business is local and you have already found a local method to reach your audience. Still, eventually you might want to create a geo-targeted Twitter account and reach out to collaborators and influencers in your local area. You might also want to expand from Yelp to Merchant Circle or other Local Communities and I would definitely acquire every Local Search Directory listing I could find starting with the method featured in the CommentLuv link in this reply. I have known many very successful businesses that crashed temporarily from having all their eggs in too few baskets. Social networking websites are becoming prominent with every passing day. The websites offer discussions, exchange of ideas, enhanced interaction and above all creates healthy business environment. The number of sites is overwhelming which is why we are always working to distill what works into a process that anyone can apply. Watch for a new post on which sites are most important and how we reach them all as efficiently as possible. Wow Internet Strategist, you put a lot of work into this post. It would actually make a great ebook too. It took me a little adjustment time to learn social networking doesn’t have to take 100% involvement like chat. Twitter was driving me crazy when I felt obliged to read each tweet and reply to those that seemed to require a reply. It’s funny how one of the simplest programs out there seems so confusing to those first introduced to it. .-= Brian D. Hawkins´s last blog ..Chasing The Guru Ghost =-. Thank you Brian. For those who haven’t “met” Brian yet I encourage you to visit his excellent Internet Marketing blog. I can tell by how they use it that many think they should be able to read and reply to everything streaming by at Twitter, FriendFeed and elsewhere. That isn’t possible if you are really using it for Social Networking. Wait until tomorrow for a great new post on how to effectively manage Social Networking using a process we’ve designed to be consistently active without being constantly available. There are many third party applications that can help so we’ll start with a basic “system” that will work for everyone from Internet Newbies to advanced marketers. .-= Internet Strategist @GrowMap´s last blog ..How to Evaluate Your AdWords Accounts =-. If you are a business owner, you absolutely cannot limit yourself on Twitter, just as you described! It is always good to look for retweeters because they are active in the community and will work to help you become more known. Social media marketing is the opportunity to build business connections with more people and not just keep the friends that you already have! Thanks for encouraging business owners to get involved in Social Networking. My next post in a day or so will provide a step-by-step process for getting started and an efficient way to consistenly participate without having to be online all the time. Only an hour or so a week plus 10-15 minutes a day can make a huge difference. Chris Brogan highly recommended Tamar’s book and everyone recommends Chris so these are two good investments. Twitter, if used properly, can be great for business purposes. I use it to get links to my website out there within the twitter world and I have seen up 50 more visitors on my site a week. My project is fairly new so this kind of jump is big.